We’re a few weeks along, and Red Fight District III is coming ever closer. We once again have a batch of changes to share with you! One of the major complaints by alpha testers was our mockup grab, which consisted of mockup sprites and the inability to throw your opponent forwards, which made it useless when applying pressure on a cornered opponent, as it would throw the opponent out of the corner. One of these problems has now been resolved! We now have a fully sprited version of the throw animation, and we are hard at work to implement the ability to throw your opponent forward. The previous blog showed you our newly added superstop, and while this was a nice start, the pause without any effects was a bit awkward. The screen now becomes dark for the duration of the superstop, and a quick screen shake effect take place. This is however not apparent on youtube, as it cuts half the frames of animation (and thus, the shaking frames). Of course, these superstop effects are still not final, but the superstop should be easier to read visually now. We’ve lengthened the stage vertically and added vertical panning to the game. Vertical moves such as uppercuts will now be followed by the camera, adding an extra bit of visual oomph. Attentive readers might notice we’ve changed the properties of the Hard punch dragon punch a bit. Finally, we encountered this funny ‘little’ bug a few weeks ago. Why did we wait before showing it to you? We wanted to kill it dead, so you could not recreate it at RFD. Enjoy. This entry was posted in Engine, Gameplay, video on September 9, 2014 by Marijn. As Red Fight District is approaching, we are doing our best to polish up the game to a state that we find worthy for a tournament. Originally, we wanted to get a playable version of Ushah ready for the tournament, sadly we’ve had to move our Ushah milestone back a little. As much as we love Julia, even we crave to see new fighters enter the fray, but alas, not now. We had to choose between implementing a character that would only be half done (if we would even get that far) or improving and polishing what we already have. We have chosen for the latter. A big change in terms of usability is the change to our HUD. While this is still a mockup HUD, the positioning of the bars is different and we feel that this conveys relevant information more clearly. The shatter bar has been moved underneath the health bar, this means that all the ‘life status bars’ are immediately visible at the top of the screen. Shattered now also has some basic blockflashes for extra visual feedback. Another bit of visual fidelity improvement, is the implementation of post-KO hits. Before, if for example the first hit of Julia’s flying kicks would KO the opponent, the following hits would simply whiff, now they will hit the poor opponent’s bruised body! Phoenix has been hard at work tweaking the input interpreter. It should be less easy to accidentally get super fireballs, and getting a dragonpunch motion to come out is a little less strict. And finally, the game now has superstop now! Right now it’s functioning mechanically but no visual effects have been added to the superstop, this is obviously something we hope to work on in the coming weeks. We will continue improving the game and are very much looking forward to showing our game at Red Fight District. If you are interested in participating you should hurry up, as there are only 2 out of 16 slots left! This entry was posted in Engine, video on August 25, 2014 by Marijn. A new logo, RFD and Twitter! 11 & 12 October the Dutch international tournament Red Fight District, will hold its third edition. It is one of the major tournaments in Europe, and it will feature multiple big fighting games. But also two indie games will be featured at RFD: Lethal League and Shattered! On Saturday 11 October everyone will have a chance to try out the latest version, and Sunday we will run a small tournament! You can sign up at RedFightDistrict.com. There are no additional costs for signing for the Shattered side-tournament, so what are you waiting for! We’ve been active on our Facebook page for some time now, but now we’ve also started using Twitter to keep you guys up to date on the development of the game. You can follow us @Team18K. This entry was posted in News, Showcase on August 11, 2014 by Marijn. Lately we’ve been making great progress on the engine side of the game. While much of the system was already more or less functioning, We are now polishing up some parts of the engine to make it work exactly as intended. A fairly big update which -to the player- is very difficult to see, but removes a lot of headaches on the programming and scripting side, is a reworked velocity system. Control over gravity and acceleration is now less hacky, and allows us to experiment with some new things. Right now, the knockback of attacks is plotted out manually frame-by-frame. We are now experimenting to see if a formula-based knockback would give the desired effect. More obvious system updates are the changes to crossups and the way the shatter system works. Originally, when you hit your opponent with a crossup, the opponent would move away from you, making it very difficult to combo off a crossup. Normally in fighting games, although there are exceptions, the opponent moves towards you when you do a crossup, allowing at least as many, and sometimes more combos than when hitting a normal jump attack. In Shattered, the crossups now work as expected. The video below first showcases how the crossups used to work, and shows that comboing off it is difficult, after that it showcases the new crossup mechanics, and the same followup comboing this time around. We’ve also made changes to the shatter system. We originally envisioned for a shattered opponent to be able to be hit with one more move before he is knocked down. For a long time, however, a shattered opponent would only take one hit before being knocked down, which in the case of moves that do multiple hits would not give the desired effect. In the first part of the video below, you will see that the flying kicks and dragon punch, which normally hit three and two times respectively, only hit once on a shattered opponent. In the second part you can see that the opponent is hit by all hits of these moves before being knocked down. This entry was posted in Engine, Gameplay, video on July 30, 2014 by Marijn. This post will conclude our presentation of Julia’s hitboxes. We will discuss her command normals, shatter attack, specials and super. Normals often have subtle hitboxes that have specific applications, specials moves generally have a lot bigger and dominant hitboxes. This is Julia’s only command normal, it is a low hitting move that knocks down on hit and has slightly better range and a better hitbox than the cr.HK. To balance it out against the cr.HK, the move has a slower startup and a hefty recovery. The move can be cancelled into a fireball to make it safe on block. One should be careful not to whiff it, as this sets you up for great punishment. The Shatter Attack is still very much a work in progress move. Right now it reuses the sprite of the j.HK, however with different hitboxes. Notice that during her attack she is lower body invincible and she is considered airborne. The invincibility allows her to dodge low attacks and hit it as a devastating counterattacks. Because the move is airborne, the move is also unthrowable. You can therefore decide to throw it out when you anticipate a throw. While this move beats two very common tactics (low attack and throw), it is very unsafe on block, and one needs to be very careful to throw it out. Julia’s projectile is quite high up vertically, which makes it a little difficult to jump over. Because of this same fact some characters will have options to go under it (as Julia does herself with cr.HK). As you can see, the hitbox of the projectile extends a little further down than you might expect from the sprite. This is to make it so that the fireball doesn’t whiff over crouchers normally. Both versions of the projectile have the same hitboxes. The hard punch fireball is quicker but the recovery of the move is slightly longer. Julia’s dragonpunch is an excellent anti-air and has incredible priority to beat other moves out. The recovery is huge, which sets you up for brutal punishment if you whiff it. Both the light and heavy versions can be supercancelled. The light version is invincible during the entire startup, but can be hit at the feet during its first active frames. As a result it will trade with a meaty attack if you reversal with it. This is not necessarily disadvantageous for Julia, as the dragonpunch juggles and it is possible to follow up with attacks after a trade. Unlike the hard version, the light version only hits once. The hard version is completely invincible during the first hit, which means it will beat out meaties clean, but it has slightly longer startup. The hitbox of the rising part of the dragonpunch is identical for both the light and the heavy versions. While this part of the move is not invincible, the priority is still very good, and covers a good amount of vertical space, making this section of the move also a potent anti-air. The two versions of the flying kicks in terms of hitboxes are very similar, but the framedata and hit effects differ considerably. These moves are the most damaging special moves in Julia’s arsenal and are very unsafe on block. It is mostly as a tool for dealing damage, but can also be used to quickly cross some screen distance. The light version can combo off light attacks, does two hits and does not knock down on hit. After it is hit both players recover at the same time, which allows Julia to press her advantage. The hard version does not combo off light attacks, does three hits and does knock down. While both these moves are important combo tools, it should be noted that they will whiff on most crouching characters, and therefore you will only be able to maximize the damage with these moves if you catch your opponent standing. Clearly this move has not been completely drawn yet and we are still using placeholder art. As a result many of the hitboxes are still subject to change. There are several properties which will certainly remain the same. There are two versions, the light version is a slower projectile, while the hard version is a faster projectile. The hitbox will be both vertically and horizontally bigger than the normal projectile. The move will hit five consecutive times, and will deal a massive amount of damage, it does not knock down. If you want a combo into super to do a knockdown, you will have to supercancel the Light punch dragonpunch into the fireball. So that’s it! Those are the moves of Julia. We hope you’ve found these showcases interesting and that you have gotten some insight into our technical design decisions of the game. This entry was posted in Characters, Design, Gameplay, Showcase on July 21, 2014 by Marijn. Jump normals are always a challenge to get right in fighting games. Because movement is so much more limited by a jump, a lot of factors like range, start-up and active frames become less important than the are on the ground game. This often leaves characters with a plethora of jump normals that are hardly ever used. We have decided that we want every single jump normal to have a specific function, so that every single button can plausibly be used in high level play. Julia is a good example of this design decision. Every single one of her jump normals has a specific function, and you will have to make specific decisions on what button to press with every jump you do. Julia’s jumping light punch hits fairly high up, and will whiff on most crouching opponents. Its main use is therefore air-to-airing opponents. While its hitboxes are not amazing, the long active period (12 frames) of the attacks, allows Julia to cover a large part of the jump arc with an attack box. This makes it a low damage, low range, but easy to use air-to-air normal. Together with the jumping hard punch, this move is one of Julia’s main jump-in attacks. The damage and blockstun that this move does are lower than that of the jump hard punch, but it makes up for this because of its cross-up potential. As you can see the attack box extends behinds Julia, this allows for her to jump over the opponent and still hit them. This damaging, and very deep hitting jump attack is Julia’s main jump-in tool. It easily hits crouchers and does a lot of blockstun. The attack box is somewhat smaller than that of other moves, making this move specifically geared towards jump-in attacks, and not particularly useful as an air-to-air. The excellent upward angle on this move and the formidable damage, make this attack Julia’s scariest air-to-air normal. Different from the jumping light punch, this move has shorter active frames, forcing the player to be more specific about when to press it. But when it connects, it hurts. Because Julia pulls her legs up during this move, she is able to dodge some incoming fireballs. This is once again an example of an emergent property inspired by the animations Bob Sagat has drawn. That concludes our discussion of Julia’s basic normals. Next post we’ll discuss Julia’s single command normal, specials and super. This entry was posted in Characters, Design, Gameplay on June 29, 2014 by Marijn. This post we’ll talk about Julia’s crouching normals. It should be noted that the hitboxes that we present are technically still in development. And while they will not change a whole lot, small tweaks are still being made to this day. In fact, one of the boxes presented today was changed minutes before writing this post. Julia’s crouching light punch is a fairly straightforward move. It’s a quick chainable light attack that doesn’t hit low. It does beat out other attacks as easily as the crouching light kick, but it can be cancelled into specials and supers. The crouching light punch is one of Julia’s main tools for setting up combos off light attacks. This crouching light kick doesn’t have any hurt box on the limb when it is active. This makes it a potent low hitting attack that can easily beat out other pokes, as the limb itself is invincible. However, there are still reasons to choose to press cr.LP over cr.LK, despite its superior hitbox. cr.LP hits slightly higher and there are fewer moves that could easily dodge attacks that high, and you might even hit your opponent in the start of a jump where cr.LK might whiff. Moreover cr.LK cannot be cancelled into specials or supers, so you will have to chain into cr.LP if you want to combo into a special move. The move is used to beat out jump-ins with relative ease, as it only takes one button press to hit the opponent out of the air. Because Julia stays low to the ground and the attack box is fairly wide, the cr.HP is a fairly consistent move to use as an anti-air in a variety of situations. It can beat out both crossups and normal deep jump-ins quite effectively. One has to be careful with timing it though, because the recovery is long, so you do not want to whiff it. Because of its fast start up, it also functions as a reasonable move to use in block strings. The sequence cr.LP, cr.HP is a tight string that will beat out opponents mindlessly mashing buttons after blocking. Julia’s crouching hard kick is a very potent and long range poke. Unlike other four button fighters, cr.HK in our game does not necessarily function as a sweep that knocks down. Julia’s cr.HK is one of those moves that isn’t. It’s an awesome, fast, low hitting cancellable and long ranged move, which plays an important role in the footsie game of Julia. One might notice that Julia’s hurt box for this move is considerably lower than the other crouching attacks. Because of this, Julia is actually able to use cr.HK to dodge fireballs. This is one of the wonderful ’emergent’ results that we have gotten while working on this game. When me and Coal designed this move, we never intended for it to go under fireballs. But when I added the hitboxes that best fitted the animation that Bob Sagat drew, this was the natural result. We feel that such cases of the game ‘designing itself’ should be embraced, as it makes for natural and understandable hitboxes, as well as interesting intricacies which simply cannot be added by brute force. Next time we’ll look at the jump attacks. This entry was posted in Characters, Design, Gameplay on June 15, 2014 by Marijn. As promised in our previous blogpost, the coming weeks we’ll be discussing some details of Julia’s hitboxes and properties, to give some insight into our design philosophy and something to study for those who are into that sort of thing. While the hitboxes are fairly straightforward, here are a few things you need to know to make sense of them. Red: Attack box, the part that actually hits the opponent. Cyan: Collision box, this is a character’s ‘physical’ body, when an opponent walks up to you, this is what you bump up against. White cross: The pivot, this is the point that decides what the ‘front’ and the ‘back’ of Julia is. Let’s first talk about some general design philosophies. In the old days, many fighting games would have a fixed ‘limit’ of certain boxes that could be on the screen, and therefore you would have quite consistent amount of attack or hurt boxes. Some games would allow two hurt boxes and one attack box per character per frame, while other games allow, for example, three hurt boxes and two attack boxes. In this modern age, there is of course no true physical limit to the amount of hurt boxes and attack boxes you could use. Nevertheless, we feel that it is still useful to have such limits as a rule of thumb, as we feel it makes properties of moves a bit easier to feel out intuitively. As can be seen below, our rule of thumb is to have two hurt boxes and one attack box on the screen. We can easily break this rule, and when we feel that it will be necessary, we certainly will. but for Julia, it has not yet been necessary. Now let’s get to the actual hitboxes, this week we’ll be discussing Julia’s standing normals. 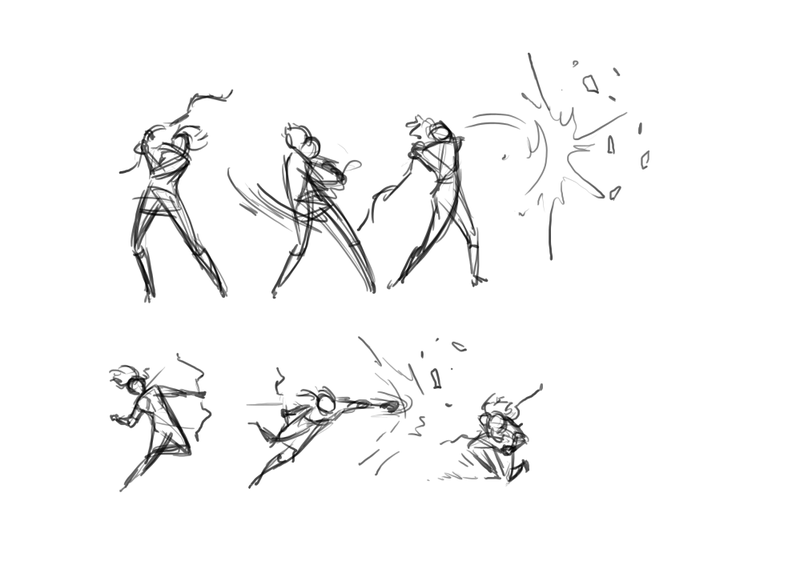 Julia’s standing light punch is a fairly straight forward punch. It has good advantage on hit and on block, but it will whiff over crouching characters, making it not particularly strong as a pressure tool. However,it is a good low-risk anti-air option against hops, that you can throw out pre-emptively to cover the space in front of her. This standing light kick is one of my favourite moves in Julia’s moveset, not because it’s so strong but because it’s so specific. The normal is a light normal with quite a bit of startup and recovery. However, it is a formidable footsies tool. As you might notice her hurt box is very far behind her collision box. Whenever Julia does this move, her hurt box moves backward. With proper spacing, this can make long ranged low attacks whiff completely. The great range on the poke then allows her to hit the opponents move. This allows her to do this move any time she sniffs out a crouching hard kick of the opponent and hit them out of it. This move can be super cancelled. So if you are confident about your read, you can stick out this move and buffer the super. Julia’s standing hard punch is her most damaging normal, and it can be special cancelled. Therefore, it is very important for maximizing damage on a punish combo. But outside of punish situations this move has great uses too. The move has great range, which makes it useful in footsie battles. One needs to be careful however, as the move will whiff over crouching opponents. The standing hard punch covers much of the same space as the standing light punch, while having more range and is more likely to beat out an opponent’s attack. Combined with its high damage output, this move is a very scary anti-hop tool. However, this move is both slower to come out and longer to recovery than the standing light punch, making it a high-risk/high-reward answer to hops. This standing roundhouse is the only standing normal whose attack box stick out above the hurt box. As a result it is able to hit people who come in on Julia with a normal jump. The range is good, but the start-up is fairly long. Making this a good anti-jump normal to hit people that are not necessarily jumping in to hit a combo, but rather to poke or cover some distance. I hope this has given some insight into the design and application of Julia’s normals. Next time we’ll discuss her crouching normals. This entry was posted in Characters, Design, Gameplay on June 1, 2014 by Marijn. In the last weeks, we have made great progress in terms of finishing up Julia, and we’re currently in the homestretch to having her done (for now). This mean we are spending a lot of time on polishing and tweaking the framedata, hitboxes and animations. Once we are done with these final tweaks, we will finally start working on our second character, Ushah, and we couldn’t be more excited! On the programming side, all the goals for the engine we had for this ‘Julia-phase’ are done, and our programmer is already gearing up for the next phase, where we will finally get rid of our rather dated and heavy engine. The scripting for Julia is still being tweaked every day. Many pixels and lines of code are examined to make sure that all the moves have the proper spacing, as to not create extremely strong combos or braindead hitconfirms and to make sure that the jumps and hops jumps are perfectly spaced to set up that one awesome ambiguous cross-up. 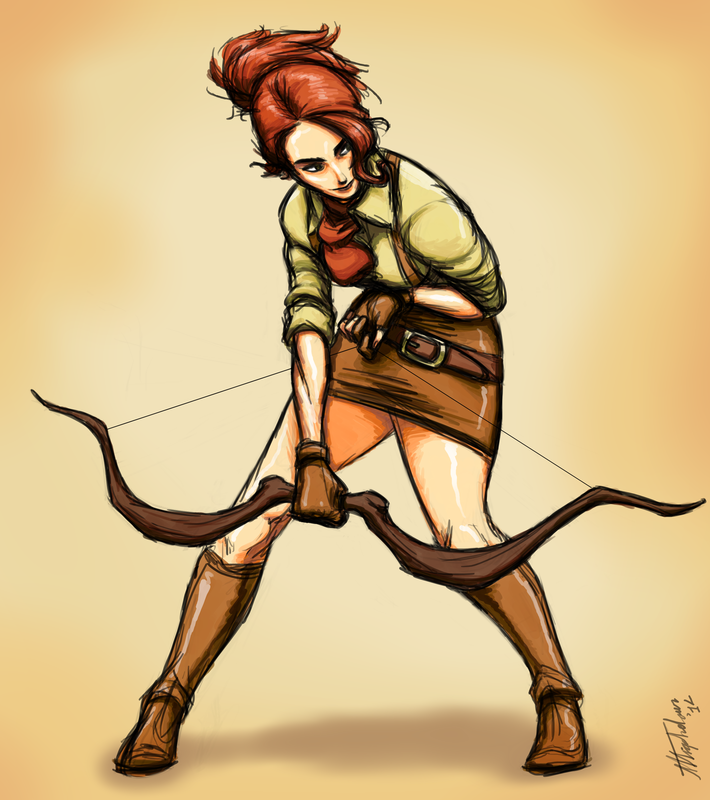 On the artwork side, our animator has delivered a piece of Julia which portrays her in the style we like to see her in, a mixture between western comic style and a Disney-esque vibe. Sadly, as much as this is a gorgeous drawing, having him as our main artwork guy as well as animator/spriter will spread him too thin, so we are in dire need of some new blood. Are you a talented artist in need of some portfolio work or just experience, drop an email at djono [at] team18k [dot] com. Do note, at the moment we are without funds, we hope that this is a temporary predicament, but at the moment we can’t offer any financial compensation. Attentive followers may have noticed that Julia’s Break* uses the animation of Julia’s jumping HK as a grounded attack, we want to eventually create a completely new animation for this move. We’ve been brainstorming some different concepts, and Bob Sagat has drawn up some quick sketches for this move. Julia now finally has fully drawn wakeup animation and flip animation. We have also tweaked here jump arcs and added a quickstand mechanic, all are shown in this video below. In the coming weeks we will showcase some hitboxes and insights on why moves have certain properties, all explained by our framedata master Phoenix. 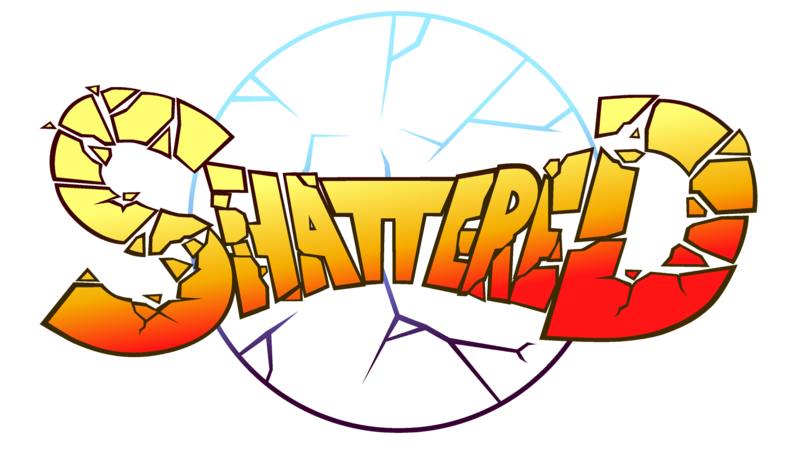 *As we ourselves got confused by all those ‘shatters’ in the Shatter System we have chosen to rename the ‘Shatter Attack’ to Break. This entry was posted in Characters, Gameplay, video on May 17, 2014 by Marijn. On the 18th and 19th of april we showcased Shattered at RSDxTheParty, a colloaborative tournament of the RSD tournament series held at the LAN party “TheParty” in Eindhoven, Netherlands. Over fifty fighting game enthusiasts spent over two days among hundreds of visitors of the LAN Party. We as Team18K were present with a Shattered setup. A large part of the competitors checked out our game, as well as some people not competing in the fighting game tournament at the LAN. Even when players didn’t provide verbal feedback, it was really helpful to see people people actually try out moves and tactics, to see what moves got abused and which ones got ignored. Obviously its impossible to come to absolute conclusions, but it helped us to recognize what needed fixing and tweaking. Another delight was to see more experienced fighting game players instantly recognize some of the more hitbox specific details that we built into our game that could give situational advantages. But not only have we made the game functional, we have also worked hard on making the presentation better. As you have seen in previous blogposts, the gamescreen still showed the full stage, and all kinds of debug information would appear at the top and bottom of the screen. After RSDxTheParty we did not sit still, and implemented even more features. We now have some preliminary hitflashes in place, and we have rewritten the knockback code. We want to thank everyone at the tournament that took their time to check out our game, it was an awesome experience, and we’re looking forward to our next showing! This entry was posted in Showcase on April 30, 2014 by Marijn.